Dehydrated tomatoes almost over ripe tomatoes for 12 -14 hours at 135 degrees. It is not necessary to remove the seeds and skins. 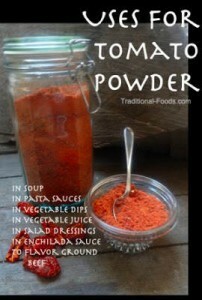 They can be dehydrated at blended into the tomato powder. It is a great way to use tomatoes that may have ended up in the compost bin otherwise. Slice the tomatoes 1/4 of an inch thick and dehydrate until crisp. Allow to cool before throwing them in the blender. Store in a glass jar, not plastic. Paste will thicken as it adsorbs the water.